﻿FietsVAK is thé business, informative and inspiring platform for the two-wheeler industry. Wiki bike.com, the platform of Cycling out of Poverty for co-creation of bicycle designs for the bottom-of-the-pyramid (people who live on less than $ 9 per day), was also present. Our message: Business and poverty reduction go hand in hand. 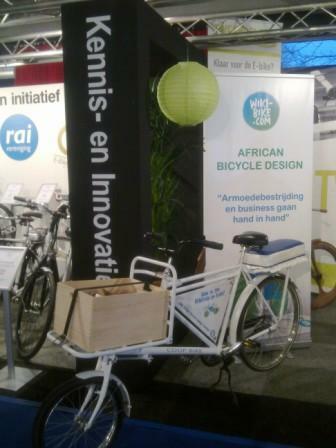 The two-wheeler industry who visited the FietsVAK 2011 can make a difference on the incomes of African families by sharing knowledge and innovative ideas from the bicycle industry. Want to help develop a healthy African bike (parts) market? Send an email to luuk@cyclingoutofpoverty.com. No Comments to "Wiki-bike.com at bicycle fair “FietsVAK 2011”"